Dr. Soyica Colbert moderated discussions that explored Hansberyy's A Raisin in the Sun in three different cultural contexts —South Africa, Sweden, and the United States—as well as the larger cross-current themes of racial equality and justice, the legacies of Hansberry, the Civil Rights movement, and apartheid. The program included remarks from Ambassador Mninwa Mahlangu, Embassy of South Africa; Linda Zachrison, Cultural Counselor, Embassy of Sweden; and Joi Gresham, Director and Trustee, Lorraine Hansberry Literary Trust; as well as a discussion with Josette Bushell-Mingo, OBE, Artistic Director, Riksteatern; James Ngcobo, Artistic Director, Market Theatre; and Lab Think Tank member Kwame Kwei-Armah, among others. Dr. Colbert’s remarks begin at 40:09. The event was originally livestreamed by HowlRound TV at howlround.tv on Monday, March 27 at 7:30 p.m. EDT (New York); Tuesday, March 28 at 12:30 a.m. BST (London); Tuesday, March 28 at 1:30 a.m. SAST (Johannesburg); and Tuesday, March 28 at 7:30 a.m. CST (Shanghai). Lorraine Hansberry: Reimagining Biography panelists include Soyica Colbert (author of the forthcoming Lorraine Hansberry: Artist/Activist (Yale University Press, 2018) and professor of African American Studies and Theater & Performance Studies at Georgetown University; Imani Perry (author of the forthcoming Looking for Lorraine: The Radiant and Radical Life of Lorraine Hansberry (Beacon Press, September 2018) and a professor of African American Studies at Princeton University); Tracy Heather Strain, (director of Lorraine Hansberry: Sighted Eyes|Feeling Heart, PBS national broadcast January 2018); and Margaret Wilkerson (author of forthcoming Lorraine Hansberry: Am I a Revolutionary? and Professor Emerita of African Diaspora Studies and Theater, Dance, and Performance Studies at the University of California, Berkeley). 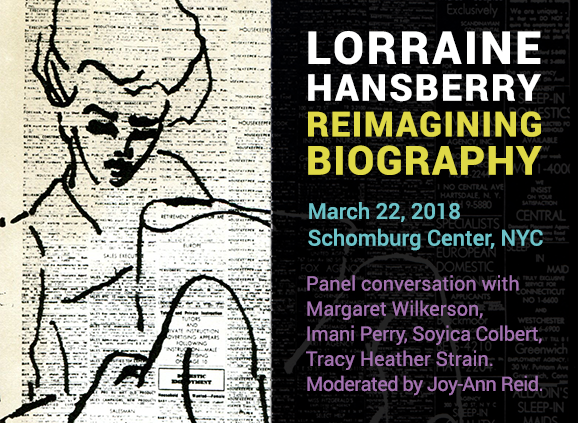 The panel will be introduced by Joi Gresham, the executive director of the Lorraine Hansberry Literary Trust, and moderated by Joy-Ann Reid (national correspondent, MSNBC).